In October 2008, Marlies Schild's world collapsed around her when the best slalom skier on the circuit shattered her left leg during a training run. But Just over a year later in December 2009, the Austrian ace was back at the top winning a slalom race at Lienz by a staggering advantage of nearly two seconds on her closest rival. Two weeks later, she won again at Flachau for her 20th World Cup slalom win and with the 2010 Vancouver Olympics now on the horizon she is once again favourite for the slalom gold. As a youngster she showed great appetite and prowess as a downhill racer but threw in the towel at age 13 in 1994 after a dreadful fall that needed five knee operations to overcome. Since then, slowly but surely, she has mastered the slalom craft. In her first top level outing back in December 2001 at Sestrieres she came 25th at her first World Cup event. But less than a year later she climbed the lowest step of her first podium having finished third at Aspen. Her talent shone through as clear as the driven snow at the 2003 world championships at Saint-Moritz, where she won a silver medal in the slalom and managed fourth in the combined. The 2005 worlds were less fruitful, where she fell by the wayside in the first round. She did however fight her way to a bronze medal in the combined. After a stunning start to the 2005-06 Olympic season when she won three straight slalom races, she arrived at the Turin Games as hot favourite for the slalom gold. Accompanied by her boyfriend and compatriot Benjamin Raich they formed the greatest slalom love team in the world and dreams of a golden double were what the media were crowing about. But it didn't quite go perfectly to plan as Raich took gold in the slalom and giant slalom while Schild would settle for silver in the combined race and bronze in the slalom. 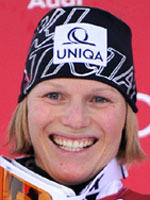 It was only considered a minor setback and the following season, she won seven of the nine slalom races and easily took the globe in her discipline before successfully defending her title the following season with five more wins, not to mention silver and bronze in the slalom and combined races at the 2007 world championships. She will be 28 at Vancouver and with her injury now a thing of the past, her goal will be to bring Austria the Olympic slalom gold, they have not enjoyed since Petra Kronberger back in 1992. And when her career finally winds up, her talented sister Bernadette is waiting in the wings and recently made her World Cup debut.